Horse racing in Britain has been canceled until at least Wednesday over an outbreak of equine flu, with the British Horseracing Authority saying the decision was made to protect the health of the horse population. Justify was the key player on a horse racing "dream team" -- the best trainer of all time (confirmed Saturday) in Bob Baffert, a Hall of Fame jockey in Mike Smith who made all the right moves and a thoroughbred whose name will rise above them all. Just three years removed from the most recent Triple Crown, the 90,000 who showed up to cheer Justify were not turning their noses up at a chance to witness history. Justify might not have given a legendary performance in his Preakness win, but the victorious chapter at soggy Pimlico moved confident trainer Bob Baffert & Co. one step closer to a storybook finish at Belmont. Justify ended the so-called "Curse of Apollo," becoming the first horse since 1882 to win the Derby without racing as a 2-year-old. Now, with Justify showing Triple Crown-type ability, the focus becomes ending a much shorter drought for the sport. Daniel Cormier claims UFC heavyweight title. While the grounds at Churchill Downs are typically filled with hats everywhere, this year it was the rain that took center stage at the 144th Kentucky Derby. See what it looked like in Louisville as three inches of rain fell during the run for the roses. Gayle Benson, owner of the New Orleans Saints and Pelicans, also owns thoroughbreds. After supporting her Pelicans in a Friday night playoff game, she'll be watching Lone Sailor run at the Kentucky Derby on Saturday. Justify's attempt to become the first horse since Apollo in 1882 to win the Kentucky Derby without having made at least one start as a 2-year-old leads the top storylines at Churchill Downs this weekend. 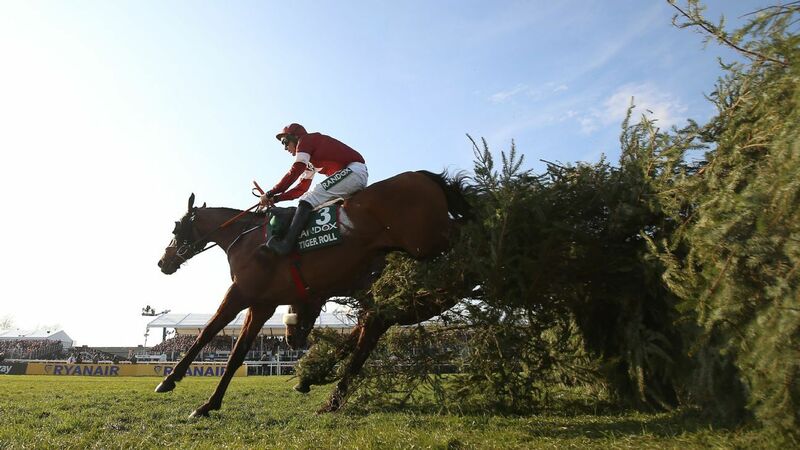 In his 14th try at horse racing's most grueling jumps race, Davy Russell rode Tiger Roll to a photo-finish win at the Grand National Steeplechase. Joseph O'Brien tipped out his legendary father, Aidan O'Brien, as both chased their maiden victory in the Melbourne Cup, while Max Dynamite completed an Irish-trained trifecta. Michael Owen was thrown off his horse twice in one day as he prepares to make his racing debut at the Prince's Countryside Fund Charity Race at Ascot on Nov. 24. Irish jumps jockey Davy Russell has received a four-day suspension for punching a horse in the back of the head before a race at Tramore. Move over Liverpool, London is the greatest sporting city on the planet -- and here's why. When Goldikova is inducted into the National Museum of Racing and Hall of Fame in Saratoga Springs, New York, on Friday, it will be the culmination of the long, shared racing legacy of the Wertheimer and Head families. Which golfer's final round of 63 propelled him to third place in the 2017 British Open at Birkdale? Test your knowledge as Steven Lynch compiles ESPN UK's sports quiz of the week. Barney Roy sprung a surprise on day one at Royal Ascot by winning the St James's Palace Stakes, with favourite Churchill only finishing in fourth. Frankie Dettori will miss the 2017 Royal Ascot meeting after a fall at Great Yarmouth last week. Think you know your World Cup finals from your French Open finals? Steven Lynch puts together ten of the hardest sporting questions to test your wits. Think you know your Champions League finals from your French Open finals? Steven Lynch puts together ten of the hardest sporting questions to test your wits. The Belmont might have looked like a series of imploded storylines and missed opportunities (no Triple Crown, no Derby or Preakness champ, no Epicharis). But winning the third leg of the Triple Crown was monumental for Tapwrit's triumphant team.